Victoria and I had wanted to go to the beach one of the days we were in town, but the somewhat gloomy weather has prevented us from doing so thus far. 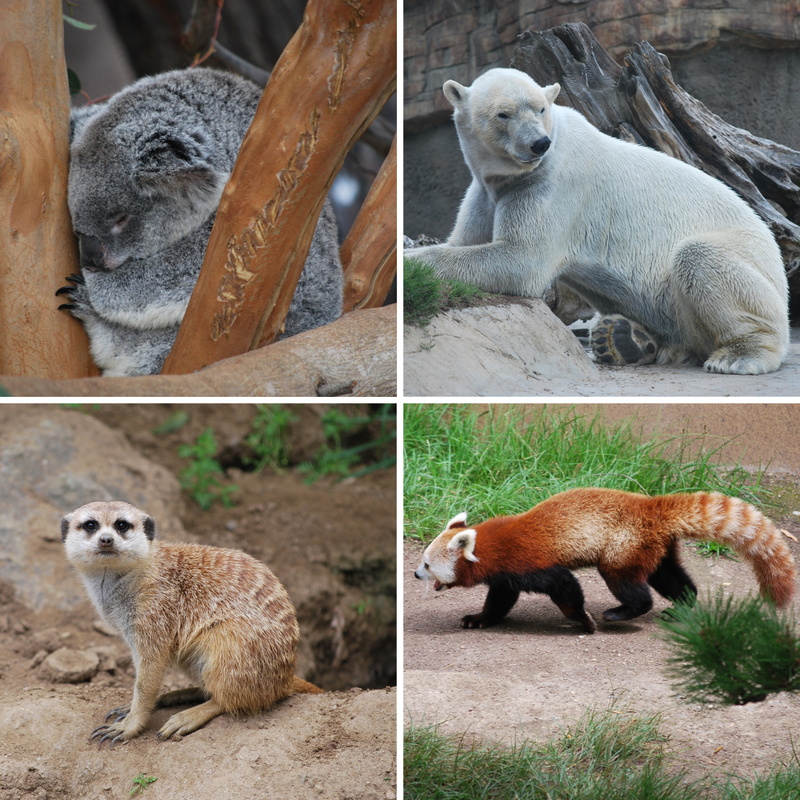 Today we decided on hitting up the San Diego Zoo, and we weren’t disappointed. It was a little surprising to see the $42 ticket price, but we both agree that it was well worth it. 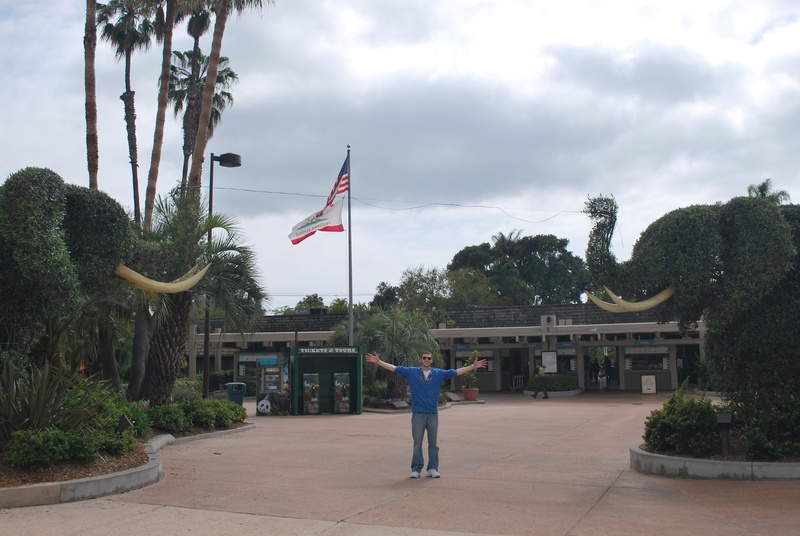 I had been to San Diego four times prior to this visit, and hadn’t gone to the zoo yet, so I figured I should go. I hope you like pictures of animals. We took the bus up to the zoo, and we arrived around 10:30. I took over 400 pictures, and I’ll be showing some of my favorites. I made sure to record in my phone what everything was, because there were many species that could be easily confused, or just plain forgotten. 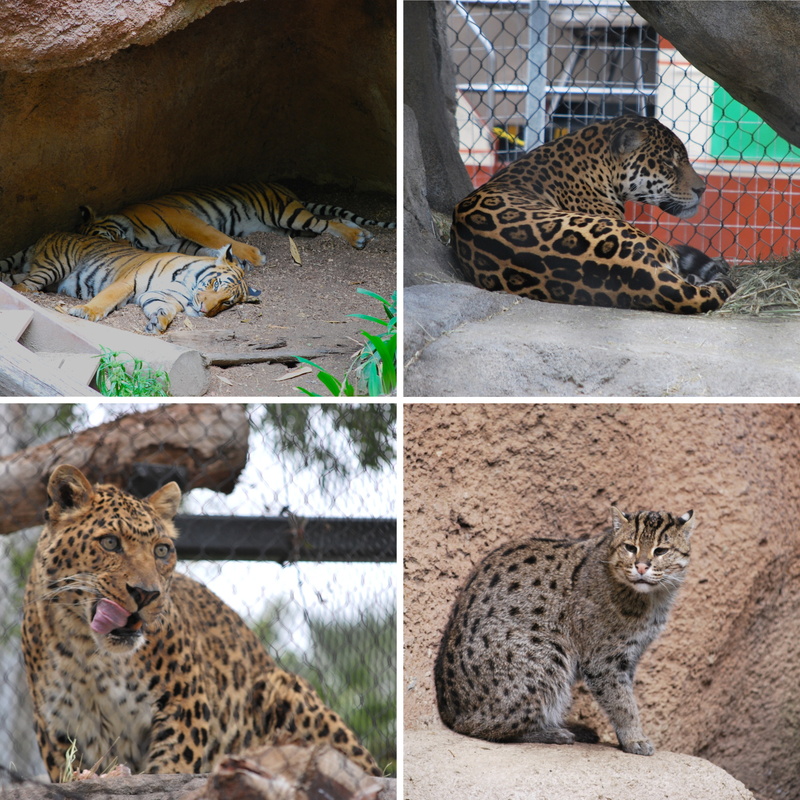 I’ll start with my favorite: big cats. I have a cat, named Prince, but I don’t think he could hold his own agains these guys. For all of the four part photos, I’ll list what everything is going clockwise from top left. 1) Malayan Tigers. I don’t know what it is about them, but they are awesome. 4) A North Chinese Leopard, who was just finishing up a meal, and I caught him at a great time. I think my favorite picture of the cats had to be of the lions. 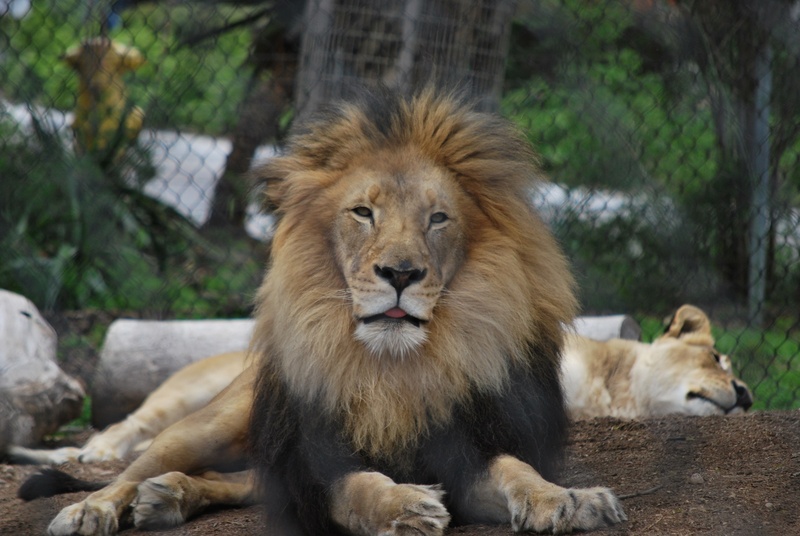 The male happened to be looking right at me, then seconds later rolled over and took a nap. 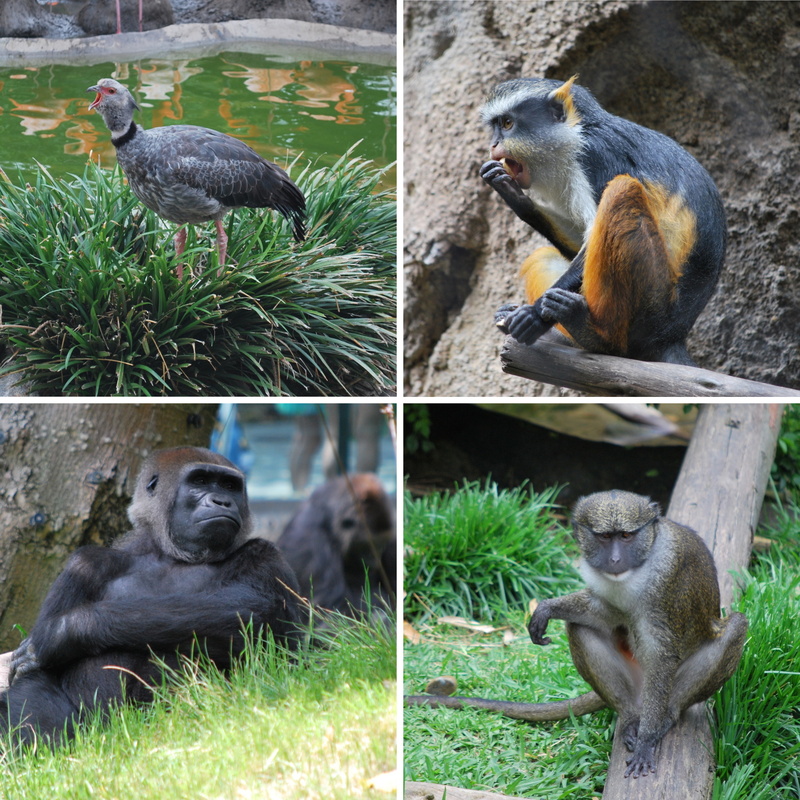 There were also plenty of monkeys, the first one, as you can see, is not a monkey. 1) A Crested Screamer, and scream he/she did, wow. 2) Wolf’s Guenon, just munching away. 4) Gorillas, I like how he’s just leaning back, passing the time. Bears were quite populous at the zoo, and below you’ll find three of them, in addition to a non-bear. 1) Koala Bear, there was another one nearby that had a cub, but she had it so close to her body, and up against a tree, that you couldn’t even tell she was holding one. 2) Male Polar Bear, this guy was chasing the female around, and Victoria and I think he was in the mood. He was foaming at the mouth and drooling all over the place. The female was having none of it though, and I think he gave up as we left the exhibit. 3) A Red Panda, I don’t think I even knew these existed. 4) A Southwest African Meerkat, who looks just like Timon from The Lion King. 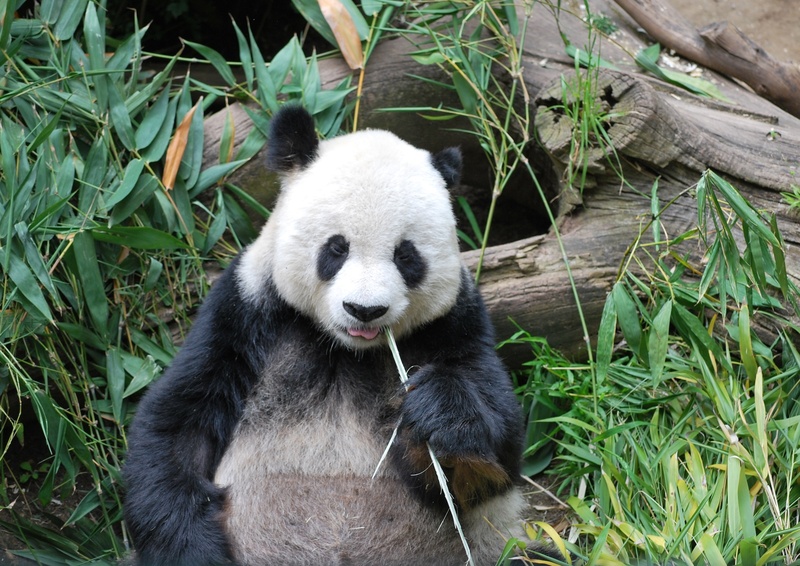 I saved the best for last; a PANDA!!! He was walking around and came towards the front of his enclosure, nestled up against a log, and started eating, it was pretty exciting. 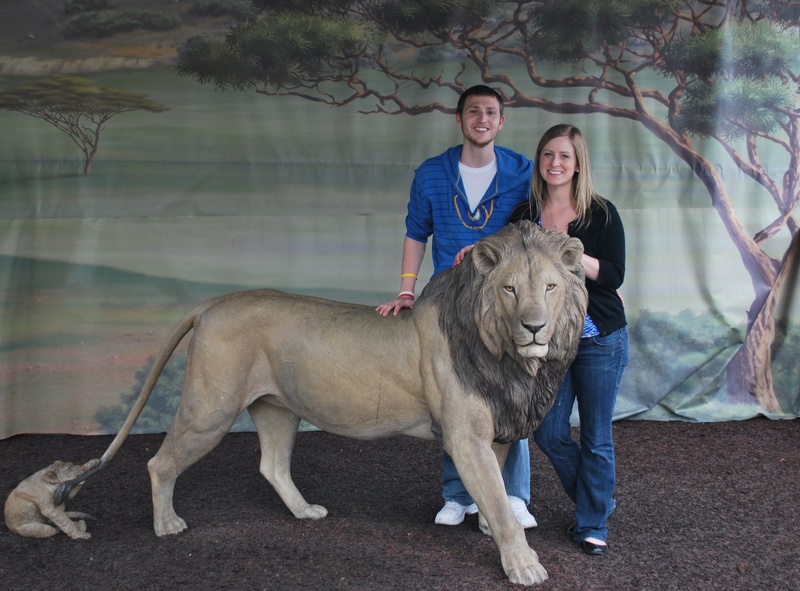 On our way out, I had another zoo-goer take a picture of Victoria and myself, in front of a lion statue they have near the entrance. I have no idea how much we walked yesterday, but it was a lot. I don’t know if walking is going to make the knee problem any worse, but it was hard to pass up going to the zoo. We left the zoo at 3:30, and took a taxi downtown, to pick up some dinner from Ralph’s, the closest grocery store to our hotel. We were both exhausted from our five hours at the zoo, and we rested a little before leaving for the game. 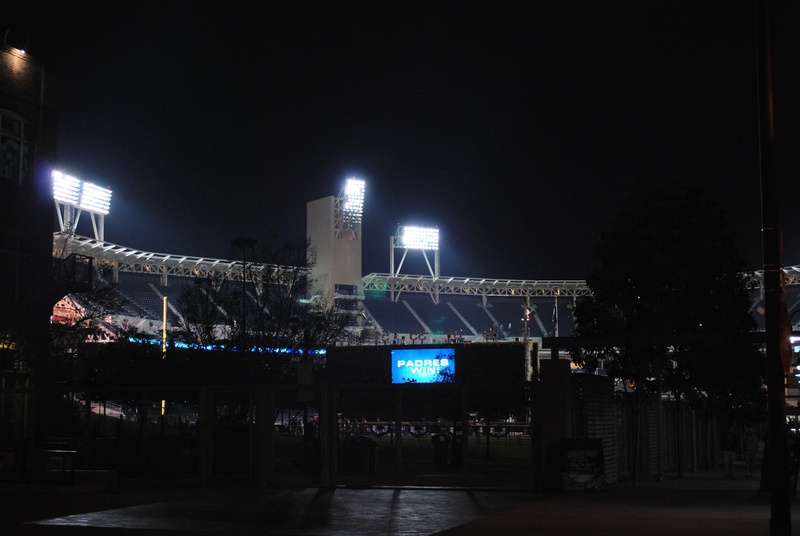 We made our way towards PETCO around 6:10. The picture below is of the back of the scoreboard, and you can make out the last bit of “Western Metal Supply Co.” on the right. That building was incorporated into the design of the ballpark (mainly because it was an historical landmark, and couldn’t be torn down. Apparently that only pertains to the exterior, because it now houses the team store in the lower level, and contains three levels of seating that are used for group parties. We did the same thing as we did for Monday’s game; I picked up my ticket that the Brewers provided, and then we got Victoria a nearby seat. It worked well again and we sat together for the whole game. Once inside we tried to find a good spot for game photo number 24. 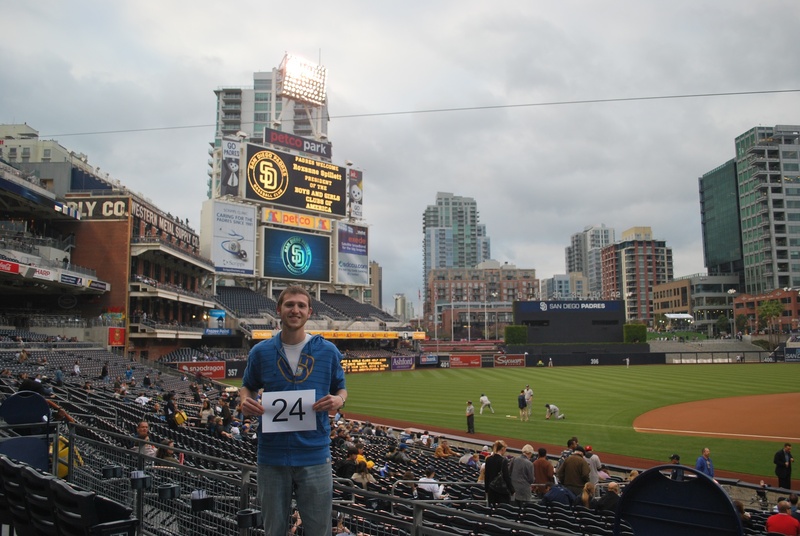 I’ll be getting the photo from the upper deck before Wednesday’s game, so we just decided on something that was (somewhat) near our seats. Telly Hughes, the Fox Sports Wisconsin in-game personality, called me earlier in the day and said they’d like to do an in-game interview with me. I had discussed this with the Brewers before the season started, but this was the first one we were doing, save the pre-game interview on the field at Wrigley on April 10th. 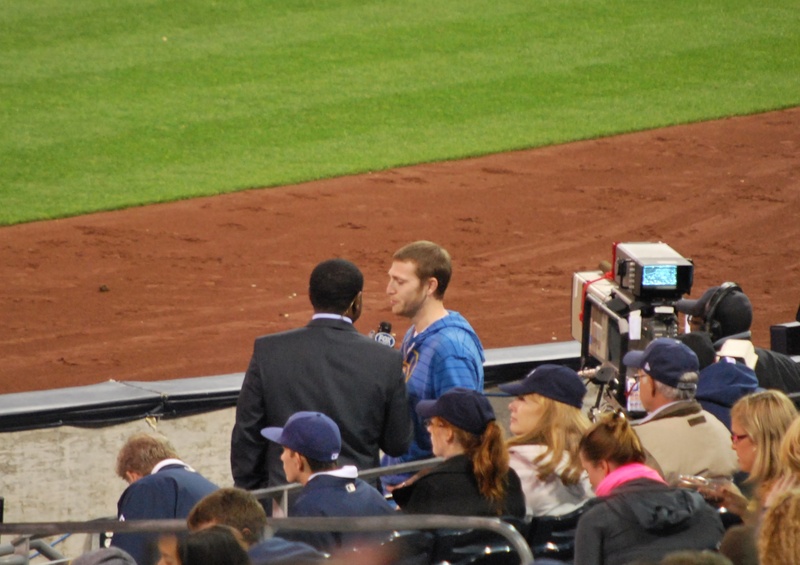 I went down at the end of the third, and talked with Telly during the top of the fourth. Once the FS Wisconsin broadcast came back from commercial break we talked briefly about what Brewers Mission 162 means, and what I’m raising awareness for; The Be The Match Registry!!! I think it went well, and my phone was blowing up for the next few innings with well wishes from friends and strangers alike. Victoria snapped a picture when I was on air, it’s a little blurry, but with the low light up in our seats, it’s to be expected. My eyes may be closed in the picture below, but I assure you they weren’t closed for the entire time I was on air. The camera that was getting the footage was in center field, and I was standing to Telly’s right in the camera well, so I was facing towards centerfield. It pained me to do so because I could hear pitches hitting the mitt and I wasn’t paying attention. It worked out that I “only” missed four pitches, but I’ll say it was worth it if a single person was moved to make a donation or consider joining the registry. Four missed pitches in a single game is a new high for me, and I’ll try to make up for it with a couple of perfectos. The game itself was a pitcher’s duel, with both starters lasting seven innings, while giving up just three hits a piece. There wasn’t too much to get excited about for either team until the eighth inning. K-Rod entered for the Brewers, got a quick out, gave up a single, and then gave up the deciding two run home run to Mark Kotsay (a Brewer last season). It was dissapointing, but I can’t be too mad at K-Rod, even though it was his third loss of the season. We’re not going to win ANY games if we score zero runs, I will bet my life on that. Final Score: Padres 2 – Brewers 0. The Brewers are actually lucky to have split the first two games. They have a grand total of ten hits over the two games. If you take away Braun’s performance on Monday night, and you’re looking at a combined total of six hits, two runs, and two losses. I found out today that Braun became only the sixth player in MLB history to record three home runs and a triple in the same game. That club is even more exclusive than the four-home-runs-in-a-game club. 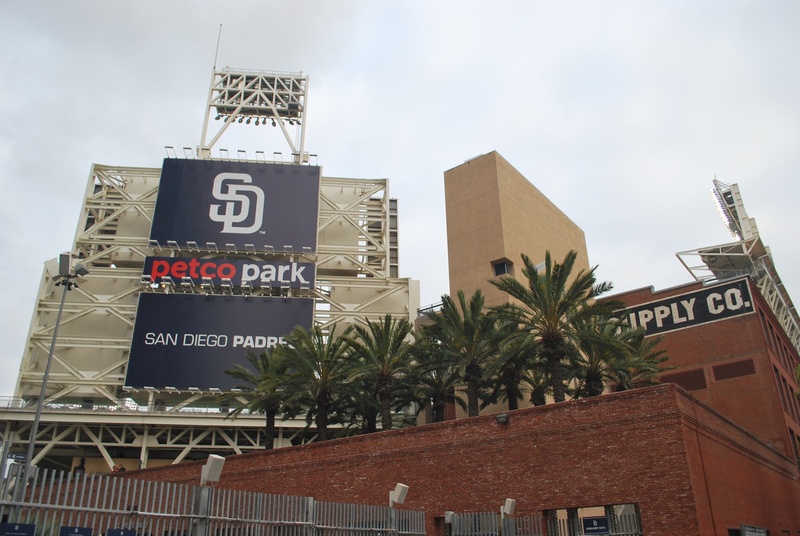 On our way back to the hotel I took a picture of PETCO from K Street. I’ll try and get some better ballpark pictures at the game tomorrow. My cousin Annie and her husband Chase are in town, and we might be meeting up before or after the game on Wednesday. Looking forward to that and hopefully a Brewers win to take the series.